See here. The strange thing is that not only do religious people trust atheists less, according to this study, but atheists trust each other less too. Is there any way to make peace with this? Maybe we can, by focusing on the word "trust". To trust someone you have to have a pretty confident idea about what they'll think and do in various situations. Both religious and unreligious people tend to know far fewer atheists, so know less about what they'll think and do. Furthermore, I think religious people are more conventional and conformist. An atheist is more likely to take a novel or even alarming position on some matter of ethical debate. That's a little scary--just the opposite of trust-inducing. Moral of the story--if you're a sober, morally middle-of-the-road atheist, it's especially important for you to wear the atheist label openly. I'll go first--"I am an atheist, and I believe in helping people, keeping promises, being nice, voting in elections, etc." My moral outlook is about the same as that of my liberal religious friends--in fact, I see no obvious difference. Go ahead and trust me! Or you can be Abraham, the father of faith, willingly sacrifice your only son to God. Who's going to trust THAT guy! I think we need to separate out two kinds of trust here... Initial trust, and developed trust. 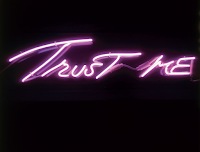 I think Atheists have developed trust, like any other person, but what atheists might lack is initial trust, since well... that seems to require a leap of faith, not something most atheists are terribly keen on. Why should I trust you? I'm an atheist just like you! So? That doesn't mean you're trustworthy, because you share the same position on God as I. Assumedly, con artists would believe the same thing about Bigfoot and fairies as I, that they don't exist... Does that suddenly make them trustworthy? Of course not. Theists, as part of their belief structure, imbues a moral superiority in their beliefs about God. If you believe in God, you must be a better person than the person who doesn't. It makes sense to trust morally good people. This person believes in God, which makes them a morally good person (at least better than the atheist). Therefore, I trust them. Cults in particular exploit this initial trust to take advantage of people. Coincidentally, we were discussing something similar (re: In Living Color's original post) after news of Hitchens' death was all over the place.